The body feels weighty and substantial and the neck looks good. I reckon all the rest is fixable with these two good fundamentals. 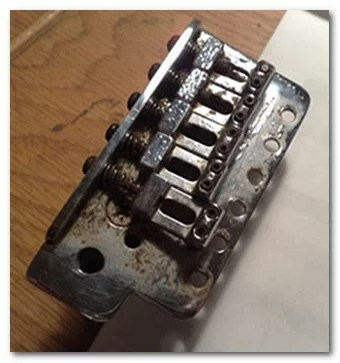 I found a matching machine head ferrule in my parts box and I had a spare Tremolo arm, bought for my Squier Strat but the wrong thread..it fit the Westone perfectly! I won’t be returning it to black. I feel like a new colour. 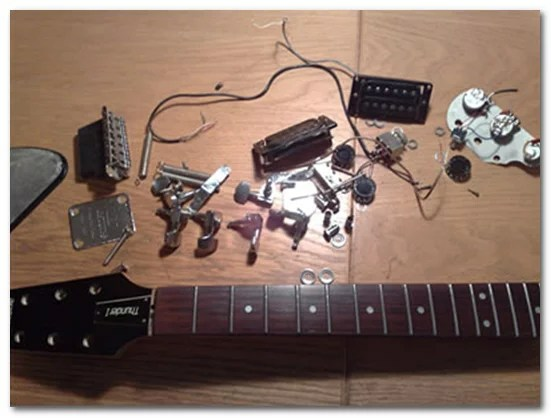 I stripped the guitar down into its remaining component parts and assessed the damaged parts. Attempts were made to salvage them. The bridge was very grungy and rusty…the saddles were stuck tight, needing my cutting wheel to get two of them off and all the screws were chewed up and useless. The only answer was to replace the set. I got some Graphtech “string saver ferra glides” which have a graphite insert to ease the possibility of string breakage, but were pretty costly at £19.95. 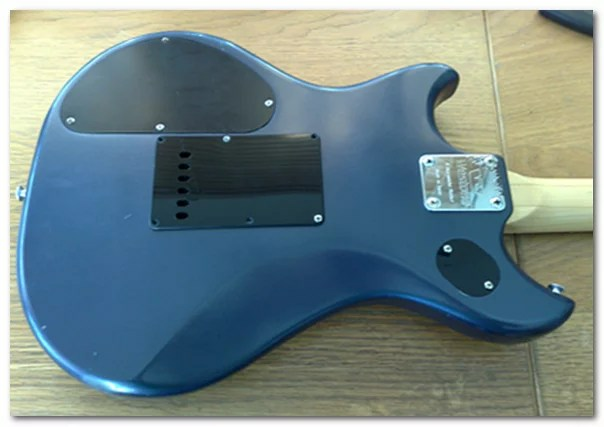 I cleaned up the base plate and tremolo block and re-assembled the whole thing. The body was sanded with coarse sandpaper to remove the top coat of clear lacquer and give a good base for the wood filler I needed to use to fill the dents and gouges. The rebuild used a selection of old and new parts. 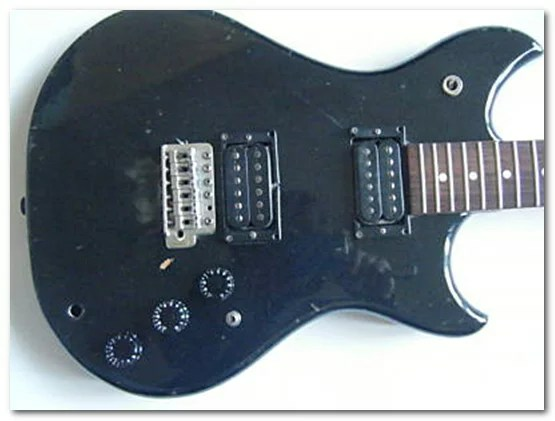 The neck only had 2 screws holding it in place, instead of the 4 it should have.I managed to find two more similar screws, and using the old neck plate I re-attached the neck. 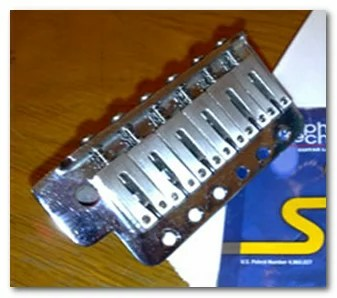 I also gave the frets a good cleaning. 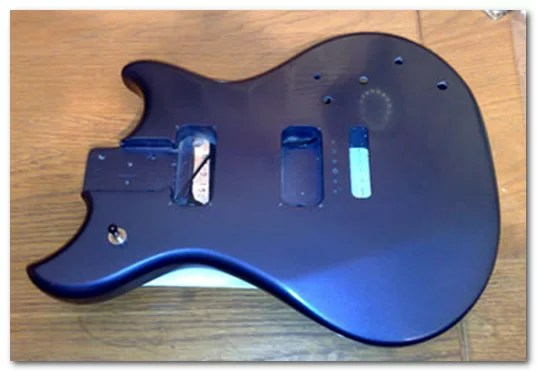 I stuck in a new nut, using 2 part epoxy glue* guessing the position. I was hoping that I wouldn’t have to break the glue joint to re-position the nut, and luckily I got it right first time..phew! 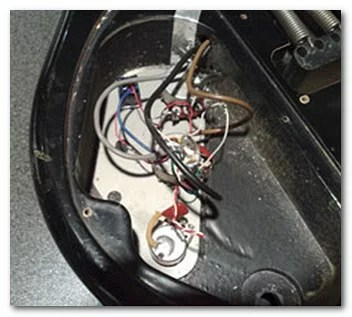 * Editor’s note: Epoxy or Crazy glue is not recommended for this operation. 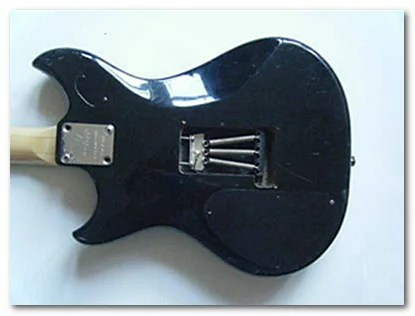 Carpenter’s glue or simple PVA (white glue) is preferred since it will easily release with a tap if the nut needs replacing again in the future. 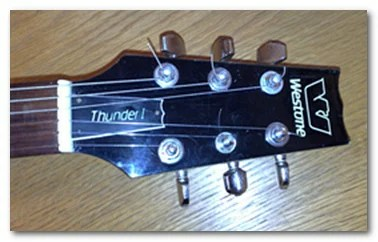 Epoxy will cause damage to the headstock. I decided on a Volvo car colour for the body, a dark blueish grey metallic colour from an aerosol can. I also needed grey primer, 2 cans of blue and 2 cans of clear lacquer as well as some 600 grit and 1500 grit wet and dry paper. 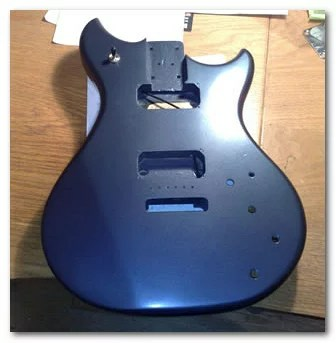 The paint is metallic and needs a clear lacquer coat to bring out the shine, so after a day or two of drying, I repeated the whole process with the clear coats. 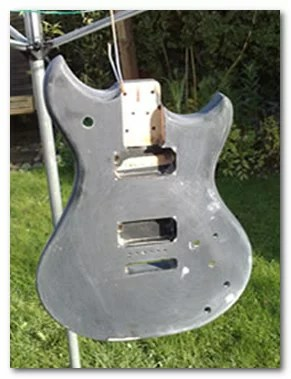 I gave the whole body a light sanding with 600 grit wet and dry to flat the surface back, taking out the worst of the unevenness from the finish. I polished the clear layers with a series of small pieces of glass paper, going from 1500 grit right up to 12,000 grit. (which feels like velvet). After a polishing the results are pretty spectacular. 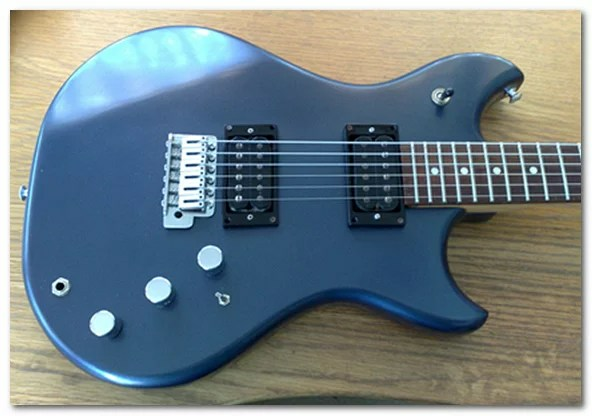 A glassy shiny smooth paint finish, which should be just as hard wearing as the original. 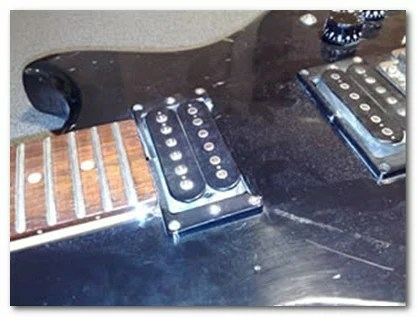 The original machine heads were reinstalled, along with the bridge, and the pickups with new screws and pickup rings. 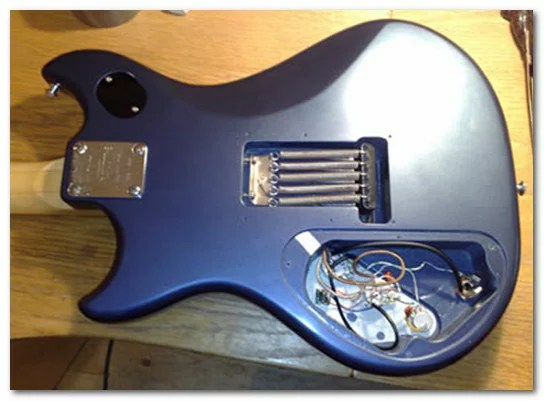 The wiring was fed through to the cavity, and a new pickup selector switch fitted.